Rare, an archaic spelling of discern. Died without issue or offspring [children]. 1. To make a choice or come to a conclusion about something: "Fortunately, we decided not to go on the trip because there was a severe storm." "Her son was having a problem deciding which university to go to." 2. To make someone choose what to do or come to a conclusion about something: "You have to decide which presidential candidate you want to vote for." 3. To bring something to an end in a definite or obvious way: "The final football touchdown decided the winner of the game." 4. To come to a verdict or judgment after thinking about it: "They decided to start the party at 7 p.m. and so they informed their guests accordingly." 5. Etymology: from or French décider; from Latin decidere "to cut off" from the prefix de-, "off" + caedere "to cut, to strike". 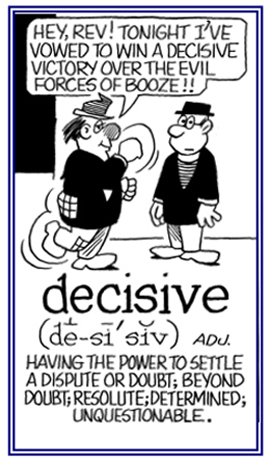 "The term decide refers to a resolving of alternatives or difficulties by "cutting through them as if with a knife or a sword" and so dealing with them "at a stroke" or with "one complete action". 1. Pertaining to trees and bushes that shed or lose their leaves annually: The leaves of the deciduous maple tree in Joanna’s backyard are turning bright red and are beginning to drop to the ground and so it will be necessary for her to rake them up. 2. A description of the teeth, antlers, or wings of animals and birds that are shed after a certain stage of development: The hunter never killed animals but he did collect the deciduous antlers which were found on the forest floor and utilized them as coat racks. 3. A reference to the thin horney plates protecting the skin of certain water animals that are shed easily or at intervals: The deciduous scales of the fish were sparkling in the shallow water of the tidal pool near the ocean. © ALL rights are reserved. 1. The act of mentally determining what a person wants to do: The burden of making a proper decision regarding the medical treatment for Sam was up to the doctor. 2. A position, opinion, or judgment that is reached after consideration: The politician made a decision that was unfavorable for his supporters and so, he lost the election. 3. Passing judgment on an issue under thinking about it: Greg asked, “Has Jack’s father come to a decision yet, as to whether we can use his car to go to the beach this weekend?" 4. A conclusion or a legal judgment reached or pronounced; a verdict: The judge went into his office where he had to think about which decision or ruling he should make regarding whether the testimony of a witness could be considered valid and legally acceptable. 5. In sports, when there is no knockout in a boxing match, the awarding of the fight goes to the boxer who won the most rounds or with more points than the opponent: A controversial decision was made one evening at the boxing club which resulted in Jack winning the contest. 6. 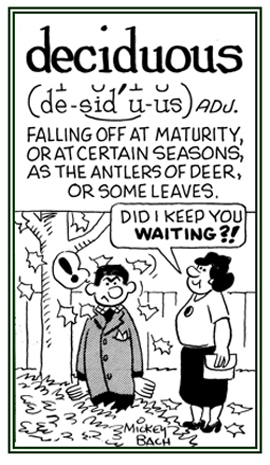 Etymology: "to settle a dispute", from Old French decider, from Latin decidere, "to determine"; literally, "to cut off"; from de-, "off, down, down from, from" + caedere, "to cut". 1. Descriptive of something which has been determined by a decision or a resolution as being crucial or most important: Carol's argument was the decisive one in determining when her family would go on their vacation. 2. Characterizing little or no hesitation; determined: The general was known for his decisive manners. 3. Indisputable; definite: The military unit suffered a decisive defeat. 4. Unsurpassable; commanding: Greg had a decisive lead in the voting of the city council. 5. Concerning a person's firmness when making crucial resolutions: Nothing could influence Jane's determination and willpower to continue helping poor people because she had a very decisive temperament and disposition. © ALL rights are reserved. Cultures that lost their existence because of external military factors and changes in cultural patterns: Some decivilizations are said to have taken place because of military invasions and drastic changes in economic conditions; as well as, how people reacted to the new social changes. Showing page 6 out of 44 pages of 646 main-word entries or main-word-entry groups.